Most of the matter in the known universe is stuff that we have no way of seeing. Dark matter–the incredibly dense, invisible material that exists between stars, planets, and all the other objects that we can see–accounts for over 80 percent of the total matter in the cosmos. What can astrophysics teach us about innovation? In an organization, spaces that exist in the gaps between bureaucratic processes, spaces that all too often go undetected, much like dark matter, are the richest areas of growth. Think of the places that straddle more than one department, that live outside of the normally rigid distinctions we follow, or that combine two or more areas of expertise. We call these spots in a business the whitespaces. Working in white spaces is about making dark matter visible, lighting up the promise that hides in the shadows. Innovation happens in whitespaces, at the edge of disciplines. In these places, creative thinkers, leaders, and experimenters don’t encounter the expected resistance to new ideas. Here, outside of bureaucratic oversight, innovators find a safe haven, an informal environment where they can pursue radical initiatives. Two kinds of people thrive in the whitespaces of organizations: the outsiders (the mavericks at the perimeter of a business with cutting-edge ideas) and the insiders (the powerful leaders of a business who have an innovative focus). For this reason, whitespaces are transdisciplinary: they promote the integration of knowledge and the creation of hybrid solutions. You’re much more likely to create something new and exciting in a whitespace than you are in any individual department. What can you do to take full advantage of these interstitial locales? 1. Seek out the whitespaces. Since whitespaces live on the border of our everyday boundaries, we need to actively seek them out in order to take advantage of them. This means pursuing projects that you might not normally pursue or that may not show up in an annual plan but still feel important to the organization. These are projects that grow beyond the edges of departments and budgets. Imagine your organization like a Venn diagram, and go to the areas where things overlap–for example, where marketing and manufacturing meet or where human resources and finance intertwine. Nearly a decade ago, a company in IT services wanted to enter the market in India. The challenge was catering to a clientele that couldn’t afford the highly complicated system that came with the organization’s standard service. They partnered with their customers to design and distribute a low-cost app that told people the price of various commodities. In this whitespace–the intersection between customer relations and marketing and design–the company successfully found a way to enter this new market. 2. Enlist the gardeners. If you want to grow, you need to find and attract the people who will promote that growth–the gardeners of your organization. There are two types of gardeners: the leaders who can provide money and the young, bright thinkers who bring that spark of creativity. If you don’t give the gardeners the opportunity to grow their projects and talents, then they will leave the company and find that opportunity elsewhere. One automobile company successfully nurtured gardeners by inviting and funding outside talent to re-conceptualize the old business model. The organization had a sector devoted to making cars and a sector devoted to parts, but didn’t have a department that focused on the entire solution. The executives saw that they needed to develop a sector that concerned itself with thinking about transportation as a whole. By gradually giving money and resources to new people, the organization eventually developed a new concept–within the whitespaces–that united both the cars and their parts. 3. Get momentum. Excess planning is your enemy. Instead of planning, run many small projects and see what works. The goal of the whitespace is to experiment, to build prototypes, try a bunch of different things at once and then learn from the results. Incorporate overlooked customers or customers who aren’t currently being served into your experiments. The risk of trying new things with those customers is relatively low. For example, one very large IT firm that provides data on rates of delivering packages had an idea to eliminate large-scale logistical planning and allow small business-owners to do that themselves. They built a simple app for these small businesses that turned out to be a wildly effective experiment. Once the firm saw the achievements of this little app, they officially entered the new market with runaway success. 4. Expand the whitespace. Hide in plain sight. You don’t want bureaucracy to find you but you also need to be visible enough so that the right people–the powerful thinkers and leaders–do find you. Make use of both physical spaces and digital spaces, like COINs (Collaborative Open Innovation Networks). One beverage company expanded its whitespace by inhabiting an old warehouse two blocks away from its worldwide headquarters, where executives found the inspiration and energy to re-develop and re-launch a once-failed drink. 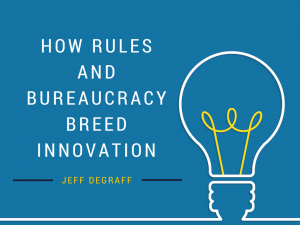 Here’s the thing that innovators tend to forget: bureaucracy is our friend. The rules and regulations of any organization are also the forces that unwittingly create whitespaces, the opportunities to break new boundaries. Bring light to those in-between spaces that other people can’t yet see. What will you do to illuminate the dark matter around you where innovation grows?